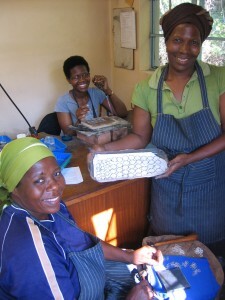 When Elsabet joined the Tintsaba workshop in Swaziland, it changed her life. “If I couldn’t work for Tintsaba, I think I would die,” she says. Elsabet, aged 44, is a single woman living in a society where having no husband can leave a woman vulnerable and poor. Her single status means a lot less than it once did, though. Since she joined Tintsaba, Elsabet has risen through the ranks to become a silver smith, and a motivational trainer for new recruits! The job has given her a dignity and independence that can’t be quantified. Elsabet’s coworker Khetsiwe agrees. Without this job, Khetsiwe’s children wouldn’t be going to school. “We would just sit and do nothing,” she said. Elsabet and Khetsiwe are just two of the skilled artisans working with Tintsaba, who have elevated the traditional craft of weaving sisal grass into an art form. They create jewellery from sisal, a common plant in Swaziland, and their jewellery routinely wins design awards. You can buy the beautiful red pendant necklaces created by the women of Tintsaba in Global Handicrafts’ online shop.